Body piercings are a common form of self-expression. If you have an oral piercing (or are considering getting one) our team at Five Star Dental Care is here to provide insight and information. As your premier dentist office in the Brandon FL area, we believe that you should know about the dangers in advance. Unfortunately, these piercings and the jewelry they accommodate can lead to serious troubles with not only your teeth and mouth, but your entire body. Piercings can bring about tooth damage, tooth decay, periodontal disease, tooth loss, bone recession, compromised immune system function and, in rare cases, death. In general, any oral piercing is going to increase your risk for an array of detrimental oral infections and complications. The mouth is full of germs and introducing foreign objects permanently is not natural for your body’s health. A tongue piercing can lead to difficulty chewing with unnatural chewing patterns that may lead to swallowing problems. The jewelry produces excess saliva from the salivary glands, which throws off the natural balance of your oral cavity. Permanent nerve weakening, excessive bleeding, and allergic reactions can also develop. Metal jewelry also can easily come in contact with your teeth, leading to cracked, chipped, or damaged teeth. The goal is for your teeth to last a lifetime, but chips, cracks, and enamel erosion compromise their durability and shorten their lifespan. Other complications from piercings may occur when hepatitis and herpes simplex viruses are introduced and even more complications have occurred with bacteria entering the bloodstream. Eventually it lodges in the heart valve and though rare, in some cases such infections are fatal. Though not technically a piercing, some people drill small holes in their teeth to place rhinestones or other jewelry. Drilling into a tooth is also detrimental for many reasons, including the potential for damage that can make a root canal necessary. The jewelry also can attract bacteria that can directly go into the drilled cavity of the tooth. It’s important to correct problems in the early stages before they become more acute. Do not wait if you suspect you may have a dental or physical problem. As a leading dentist office in the Brandon FL area, we at Five Star Dental Care encourage our patients with oral piercings to remove their jewelry before it invariably puts their health at risk. However, if you have an oral piercing and plan to keep it, we can share professional advice and ensure that you are on track for regular dental cleanings and check-ups. Call us today to schedule your appointment! At Five Star Dental Care, when a tooth’s nerve and pulp becomes infected, a dentist and patient must make a choice of whether to attempt to save the tooth by performing a root canal or to extract the tooth. There are several factors that affect this determination. These include whether there is an infection in the surrounding bone, the amount and condition of the remaining tooth structure, the strength of the supporting bone, and the presence of periodontal disease. During endodontic treatment, the nerve and pulp of the affected tooth are taken out. This tissue contains veins, arteries, and lymph vessels. The dentist or endodontist uses files of various sizes to clean out the canals. Once the roots are cleaned out and widened, they are filled with a special rubber material that seals them off. The root canal is the first step in the complete tooth restoration. After the root canal, without a dental crown, the tooth will probably become dry and brittle. The final steps are the core build-up and crown placement. A strong, natural-looking crown protects the remaining tooth and functions like a natural tooth. A root canal is frequently the most conservative treatment when a root is infected or a tooth has severe decay or damage. Root canals have a very high success rate, but there is always a slight possibility that a tooth with a root canal can have complications down the road. If there was a tiny crack in the treated tooth, it can become re-infected. Teeth with curved roots are more difficult to fill and they can also become re-infected. Occasionally, the tip of a file can break off in a root during the procedure and cause problems. Because there is always a slight risk that a root canal can fail, some patients ask if they should just get a dental implant in Valrico. This is not a black and white decision. Like root canals, a dental implant in Valrico has a high success rate, but there are risks with dental implants, as well. If you have been told that a root canal or a dental implant is needed, talk with your dentist about the pros and cons of each procedure. If you do not currently have a dentist, we invite you to schedule a consultation at Five Star Dental Care – Jeff Bynum, DDS. You can rely on Jeff Bynum for critical, unbiased information so you can make an informed decision about a root canal or dental implant in Valrico. Two words are capable of striking fear into the bravest among us: root canal. But it doesn’t need to be that way, and at Five Star Dental Care in Valrico, root canals are performed with the patient’s comfort uppermost in mind. A root canal is a procedure done to save a tooth. It treats the inside of the tooth, and becomes necessary when a cavity infects its interior, which can cause increased sensitivity and a whole lot of pain. That’s an important point: it’s the infected tooth that gives a patient so much pain. In spite of their reputation, root canals are performed to remove that pain. 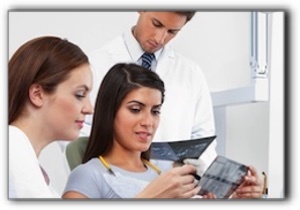 The technical term for a root canal is endodontic therapy. It works like this: after an access hole is drilled in the surface of the infected tooth, the damaged interior is removed. The remaining tooth is thoroughly cleaned, filled, and sealed. A crown is placed over the whole thing to protect it, and provide a natural-looking appearance. No one likes going to the dentist to begin with, and for better or worse, root canals make a lot of people nervous. We offer sedation dentistry to those who need it, including IV sedation. It won’t put you to sleep, but will make you feel much more at ease. At Five Star Dental Care in Valrico, we also offer cosmetic and restorative dentistry, and other services. Call us today to set up an appointment or consultation.